In Belgium, Germany’s mighty army pressed on in its invasion. In London, politicians and the public reacted to that invasion with indignation. It was clear to most that –for good or ill- the United Kingdom would enter the European War, as it is was referred to at that stage. 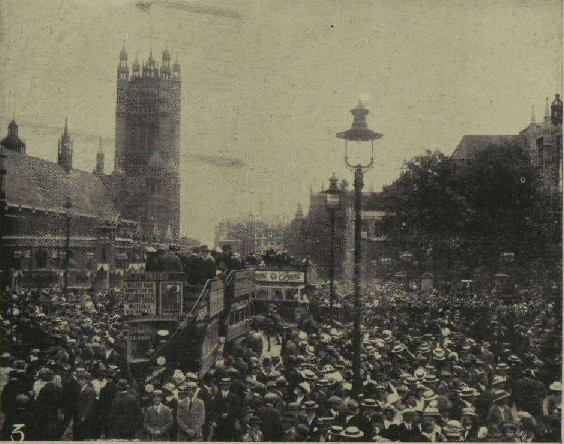 In Westminster, the crowds that had gathered in the first days of August came to a peak on 4 August. The UK’s ultimatum demanding German withdrawal from Belgium was due to run out at midnight in Berlin, 11 p.m. in London (GMT – British summertime came later in the war). When the fateful hour struck, the central-London crowd – notified by the tolling of Big Ben – cheered and sang. Thousands gathered outside Buckingham Palace, as we have seen. This crowd greeted the war with cheers. 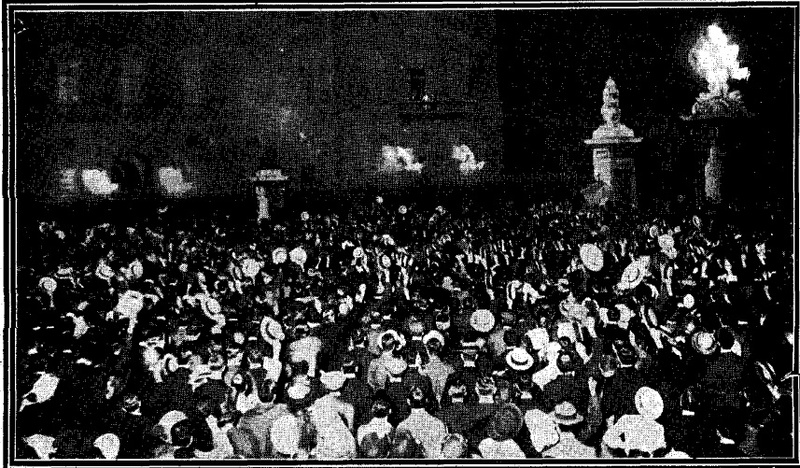 Crowds elsewhere gathered to hear the news at telephone exchanges and military bases (there being no way of finding out otherwise without waiting for the next day’s newspapers) and to cheer on the Territorial soldiers who were being mobilised ready for war. The Ilford Recorder reported that ‘Little knots of people gathered outside the local Territorial offices, and at various points all the way down the High-road from Chadwell Heath to the Clock Tower and railway station… awaiting the fateful declaration of war, and it was not until long after the momentous hour of midnight had struck that they began to disperse’. In Croydon (according to the borough’s war history) ‘There was bewilderment at first, but there was no panic. … Nor was there any war-fever, that enthusiasm which finds expression in flag-flapping, cheering, boasting, and the singing of patriotic songs. It was, as one acute observer remarked “a war without a cheer;” it was too serious a matter’. It is difficult to judge the balance of opinions. How can we distinguish between information-seeking members of a crowd and hoping to celebrate the start of a war. The crowds in central London commanded attention because they were large events; the non-appearance of the vast majority of people in those crowds was less eye-catching. The general sense one gets from contemporary sources is that people were resigned to the war: some felt that it was too risky because of the economic disruption it would cause, others thought it would be redemptive and counter the social malaise of the Edwardian period. After Germany invaded Belgium, though, actual opposition to Britain entering the war was minimal. No-one knew how long war that Britain entered on 4 August 1914 would last (and there was no dominant view as to its length). In fact, it lasted 52 months. Around a million people served in the military out of Greater London’s population of seven million. Perhaps 120,000 of them did not return. The city also faced shortages (leading to rationing), black-outs and air raids by Zeppelins and aeroplanes. Part of what makes the photos of men and women in the streets on 4 August 1914 and men volunteering for war is that we know with hindsight what a vast struggle it would be – and that it would not be the war to end wars (in HG Wells’ phrase of 1914). Looking at major events in the Great War history of London, Trafalgar Square is as good a place as any to begin, and August 1914 is clearly the best period to highlight.